I understand this is NOT the Extended DVD Set. Buy 10 or more for $0.99 each! 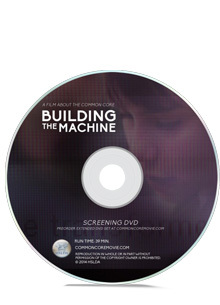 NOTE: This Single Screening DVD features the original documentary, Building the Machine. (It is NOT the Extended DVD Set, which may be purchased here.) HSLDA has produced a limited amount of Screening DVDs to facilitate public screenings and to provide bulk copies for those who wish to give away the documentary in a DVD format. Building the Machine introduces the public to the Common Core States Standards Initiative (CCSSI) and its effects on our children's education. The documentary compiles interviews from leading educational experts, including members of the Common Core Validation Committee. The Common Core is the largest systemic reform of American public education in recent history. What started as a collaboration between the National Governors Association and the Council of Chief State School Officers to reevaluate and nationalize America's education standards has become one of the most controversial--and yet, unheard of--issues in the American public. Parents, officials, and the American public should be involved in this national decision regardless of their political persuasion. Featuring interviews with Wayne Brasler, Williamson "Bill Evers, PhD, Michael Farris, JD, LLM, Chester Finn, Andrew Hacker, PhD, Paul Horton, Neil McCluskey, PhD, Michael McShane, PhD, Jim Milgram, PhD, Mike Petrilli, Joy Pullmann, Jim Stergios, PhD, Sandra Stotsky, EdD, and Ze'ev Wurman. From Agnes Tillerson of Erie, Pennsylvania on 10/30/2014 .